Winton Pottery, Grimwade Brothers and Stoke Pottery combined to become Grimwades Limited in 1900. Much of the pottery business was for the export trade, and production included dinnerware, toilet ware, teapots and coffee sets. The Royal Showroom at Winton House in Stoke-on-Trent opened in 1929, and the Royal Winton name became popular. Howard Pottery took over Royal Winton in 1964 and the business moved to Shelton. The Royal Winton business changed hands many times after 1964, but the Royal Winton name has continued to the present day. Recognize the Royal Winton style. 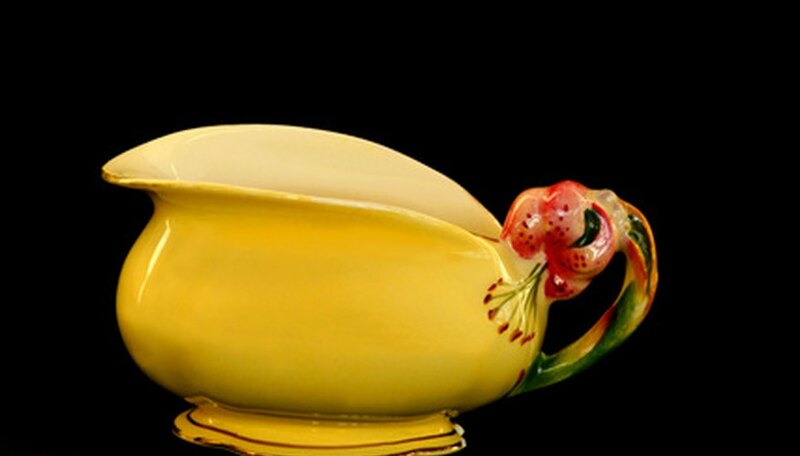 Much of the production for the last century has been decorative ornamental pottery, particularly tea sets, tennis sets, flower vases, sugar sifters and sweet dishes. These pieces are in English style, often Art Deco shapes. English sugar bowls seldom have lids, and stacking teapots with sugar and creamer on top are typical. Watch for chintz patterns for which Royal Winton is famous. These are tight flower designs, sometimes hand painted and sometimes decals, covering the outside of the piece. This is an all-over-pattern, but Royal Winton was not the only company making chintz pottery in England. Some companies stamped the bottom with the name of the pattern and “Made in England.” These are not Royal Winton. Also watch for new chintz patterns produced by Royal Winton with a new mark to distinguish the new from old. Old chintz production was from 1928 through the 1960s. New chintz production started in 1997, and should incorporate a 1995 date. Learn the Royal Winton marks. The earliest backstamp was Winton Ware or Grimwades with a globe. Sometimes the mark was a globe with a crown and the letters GB, without the Winton Ware identification. After 1917, pieces were often marked Royal Winton Ware with a crown or Grimwades Staffs Made in England and S.P. for Semi-Porcelain. Royal Winton started using the large “R” with the Royal Winton name in a circle about 1928, according to “Collecting Royal Winton Chintz” by Muriel Miller. The straight script mark is current and in use since 1951. Look for other pieces of Royal Winton. Catering to the export trade, Royal Winton produced souvenir cups and saucers and advertising plates with Canadian and United States scenes. Niagara Falls was a popular scene for demitasse sets and full-size cups and saucers. Cottage Ware is a popular Royal Winton collectible, with teapots and table accessories in the shapes of English cottages. Character jugs and musical jugs became available after the coronation of George VI in 1937 and are made in the typical quality and style of Royal Winton pottery.